Your tattoo fan? If the art of body painting is one of your favorites, be sure to equip yourself with a variety of information about him.Also, if you’re a beginner who want to dabble. Tattoos are permanent will exist forever in some parts of the body that you want to paint a picture or a word, symbol of the characters themselves. This option is entirely a personal right, but it could not hurt to understand the risks. Tattoos color, especially red, can cause allergic skin reactions in the form. In fact, the skin feels itchy body parts tattooed. Allergies are not just available soon, but can last for years after your tattoo body. Tattoos can lead to infections caused by bacteria. The sign, redness, swelling, pain and purulent. Bumps on the skin around the tattooed area, called granulomas, other problems that result from tattooing the body. Tattoos can also promote the growth of keloids or extra skin tissue that grew in the scar. When the tattoo, be sure to use sterile equipment and hygienic.Risks that may arise when the body the tattoo is a needle contaminated with infected blood diseases such as hepatitis B, hepatitis C, tetanus and HIV. Tattoos can cause swelling or burning of the skin when the owner of the tattoo were subjected to magnetic resonance imaging (MRI). MRI uses strong magnetic fields with computer technology to produce detailed images of organs and soft tissues of the body. Tattoos are permanent on your body image can affect the results of the MRI. 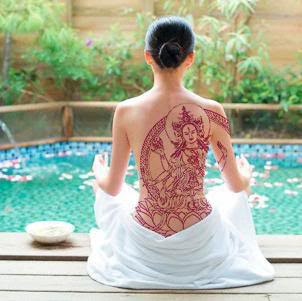 All skin problems or illnesses because of the tattoo can be treated with care and special treatment. In fact, in some cases, the tattoo must be removed if you want to overcome health problems that interfere with this.